Dealing with back pain in pregnancy is sadly a reality for many women, in fact it’s estimated that about 50% of women in the US will have a significant complaint of back ache during the nine months. And it’s not just back pain, women can also suffer from nerve related conditions such as Sciatica and Meralgia Paresthetica. Combine this with the fact that medical professionals advise the use of paracetamol only as pain relief medication, and the nine months of pregnancy suddenly feels a whole lot longer! You may be told this a lot throughout your pregnancy, however posture is quite possibly the most important aspect of good back care during pregnancy. Be conscious of how you’re sitting when at work and at home, as well as the way you walk, so you can try to get in to good habits. When carrying so much extra weight it can be easy to adopt bad posture, so think about your clothing and footwear too to ensure you’re as comfortable as possible, as this will help to encourage good habits. Prenatal yoga is a great exercise for teaching posture, and has positive impacts in labor too so perhaps consider booking a series of classes to help with your back pain. You may want to consider visiting a chiropractor to try and get to the route of your back pain and treat it at the source. It is estimated that Chiropractors treat over 27 million Americans annually, with a chiropractic adjustment being performed around 1 million times every business day in the US, so it’s certainly a popular treatment worth considering. All chiropractors are trained to work on pregnant women, using manual therapies to help readjust the body and relieve the discomfort of back pain. Chiropractic care has also been proven to help reduce labor time for women, and in a 2002 study an 82% success rate was reported when chiropractic treatment was used to turn breach babies. Pregnancy can be exhausting and often the last thing you have the energy for is regular exercise, however this can have a huge effect when it comes to dealing with back pain in pregnancy. Swimming for example is a great exercise, as it helps lift and ease the weight on your lower back, with many women enjoying the feeling of weightlessness. Even simply walking or getting in to a routine of daily stretches and pelvic tilts can really help to keep your body moving and hold back the impact of back pain. Of course you need to be careful, and not start an intense regime that your body isn’t used to, so make sure you speak to a medical professional so you can tailor a regime to your fitness level and your stage of pregnancy. With lower back pain on the rise across the US, Physical Therapists are a popular option. As well as a general rise in reported LBP across the country, the average age of women having their first child has risen from 21.4 to 25 years of age over the past 40 years, often meaning that many women becoming pregnant are less physically active in their daily lives, perhaps due to career commitments. This decreased activity leaves a large number of women under-prepared for the strenuous journey of carrying and delivering a baby. Physical Therapy covers a range of different interventions, including manual therapy, ice/heat therapy, ultrasound and traction therapy, with the aim to improve your overall function, movement, and general wellbeing. It is recommended as a long term care option for good back health, as part of both your prenatal and postnatal routine to help lessen pain and build strength. Pregnancy is a stressful time for your body, and when you’re dealing with back pain as well, you can start to feel run down. Booking a massage can help to relax your body, as well as focus on pain centres in your back. In fact, studies done in the past 10 years have shown that hormone levels associated with relaxation and stress are significantly altered when massage therapy is introduced to women’s prenatal care, leading to mood regulation and improved cardiovascular health. Blood volume within your body also increases during pregnancy, and it’s believed massage can help with circulation to keep you feeling well, as well as help with swelling and nerve pain such as sciatica. Acupuncture can be an effective treatment for pregnant women who are dealing with back pain, helping to relieve pressure points by looking at the overall body to see how health can be improved. Acupuncture looks at the two opposing forces, ying and yang, and treats where a imbalance occurs between the two, blocking the flow of vital energy throughout our body, and restoring equilibrium. 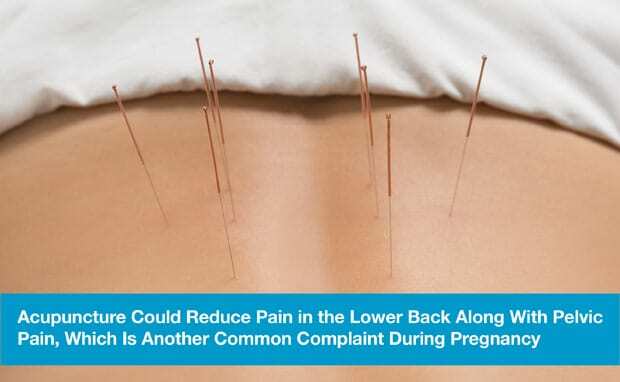 Research published in the American Journal of Obstetrics & Gynaecology reports that acupuncture could reduce pain in the lower back along with pelvic pain, which is another common complaint during pregnancy.